Common Core State Standards, an unproven set of curricular standards has been adopted for use in most states across our country to include Oregon WITHOUT public input. As part of receiving the NCLB Waiver, Oregon used CCSS as their set of standards which would prove to Secretary of Education Arne Duncan that we were agreeing to use "career and college ready standards" in our plan to get the waiver. What hasn't been discussed or analyzed is the cost of implementing these standards--not only in money, but also in time. At a time when school budgets are still being squeezed so that students are getting lost in large class sizes, schools are losing important programs, and districts are cutting school days to make ends meet, one has to wonder if this is the best decision right now for our kids. As a result, many educators and parents, are starting to question not only the necessity of these standards, but also the effects they will have on our public education system. Are they really worth having? Can we say no thank you, we will do it OUR way? One teacher and parent writes our state leaders to share her concerns. Here is her letter which she has given us permission to share. Thank you Elizabeth! Thank you for your dedication to Oregon’s public education system. There is nothing more important to our state’s future than a thriving public school system. I am writing to you as a devoted teacher and concerned parent who is deeply troubled by our state’s involvement with the Common Core State Standards, and the upcoming high-stakes assessments to which they are connected (in development by the Smarter Balanced Testing Consortium). High-stakes testing is sucking the life out of Oregon’s public schools, and we need to change course, not double-down. Oregon’s schools are in a state of austerity. At my school, this looks like 34 7th graders in my class next year (we haven’t yet figured out how to fit in that many desks); our Special Education teacher has 15 students at once, all of whom she is expected to work with one-on-one; essential supports for our school, like our nurse, counselor, and librarian, are only funded part-time. 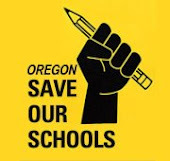 This year, the “stability budget” you are fighting for barely preserves a bare-bones remnant of the great public schools of Oregon’s past. How is it that with so little funding for our children’s education, we are talking about spending hundreds of millions of dollars implementing the Common Core State Standards and the Smarter Balanced tests? These new standards and tests will be extremely expensive. SBAC tests are estimated to cost at least twice what we are currently paying for OAKS testing. Besides that, there is the cost of technology to run these tests, and staffing to administer them. Every teacher will need hours of retraining, and then countless additional hours to retool curriculum to match the tests. New curriculums will need to be purchased to align with the new standards… the list goes on and the money flows out of our schools. I can’t find an estimate for the cost to Oregon (has anyone done the math on this? ), but Washington has estimated the cost of at least 300 million dollars. The greatest cost of these tests, however, is the time they take away from meaningful instruction. At my school, our computer lab has been booked solid for testing for the last three months. The majority of my students have spent 12 instructional hours on OAKS testing this year, plus another 6 hours on tests to predict their OAKS scores. Students who didn’t meet the benchmark the first time have spent up to 4 hours a week in additional support classes. Common Core tests will be lengthier and more difficult, potentially adding weeks to our already-bloated testing season, and countless hours to the test-prep regime. These new standards and tests come with huge costs, but what are the benefits? There is no evidence that raising standards raises student achievement. We are already well aware of the achievement gap, and that too many of our students are not meeting the standards we have already set. This gap has been well-documented for decades, and is stubbornly correlated with poverty. The problem for these kids is not that our standards are too low; the problem is poverty, and schools need more resources to make more headway to mitigate the effects. Rather than lifting our struggling students up, the Common Core standards will leave them further behind, as teachers have no choice but to march forward with the more “rigorous” curriculum, regardless of the levels and needs of the students in our classrooms. High-stakes testing is sucking the life out of Oregon’s schools. Instead of wasting our limited resources to diagnose a problem we are already well aware of, we need to invest in real solutions: smaller class sizes, wrap-around services, and a well-rounded, engaging education for all kids. More high-stakes tests will do nothing but widen the gap and waste out tax dollars.